Town councillors have given a lengthy list of objections to plans for a housing and commercial development on the edge of Morpeth. Members of Morpeth Town Council’s Planning and Transport Committee were unanimous in their opposition to the application by the Mitford Estate for a mixed use development on greenfield land neighbouring Lancaster Park. Plans have been submitted for up to 280 houses, roadside services, a hotel, employment units and parkland, which the applicant states will provide some 200 jobs. Before considering the proposal, the committee agreed to submit the Morpeth Neighbourhood Plan for examination, which will ensure it is given some weight in determining applications. Committee Chairman Joan Tebbutt said: “In the next few days Morpeth Town Council will be submitting the Neighbourhood Plan to the county council. Although it will not be ‘made’ at this stage, it would take on weight as soon as the county council passes it to the examiner and that will be within a couple of weeks. Coun Tebbutt said the estate’s proposal does not comply with a number of the Plan policies. She said it is not sustainable, outside the settlement boundaries of Morpeth and does not prioritise the use of previously developed land. “It is in open countryside where development would only be granted on limited exceptional grounds that do not apply in this case,” she added. She said it would not protect the distinctive character of Morpeth and would not comply with the strategy to focus retail development in the town centre. The site is not allocated for employment or housing land in the Plan, and concerns were also raised about the impact on wildlife, the lack of school places to accommodate the housing element and surface water drainage. Coun Tebbutt also said the proposed use of Mitford Road for emergency vehicles and access to the planned sewage treatment plant would be inappropriate and once built residents would also use the road, posing a safety risk for the nearby Chantry and Newminster Middle Schools. 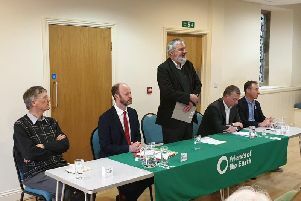 She added that the application was premature, given the progress of the Neighbourhood Plan, and backed residents’ calls for an Environmental Impact Assessment to be completed before the proposal is determined. Coun Nic Best shared the objections, but warned that the Plan will only carry limited weight in its present state. “The Plan, until it passes examination and the public test, will not have its full weight. It will be given some weight,” he said. However, Coun Best said existing planning policies can be used to justify objection to the scheme, such as the unacceptable proximity of commercial use to residential properties, and the lack of integration of the proposed site to the rest of Morpeth. Coun Best also mentioned the potential impact on wildlife. Members agreed to object to the scheme on grounds of the points raised. The objections will be sent to the county council, which will determine the application. After the meeting, county councillor for Morpeth North David Bawn said: “I was very pleased that the town council’s Planning and Transport Committee unanimously resolved to object to the Mitford Estate application. “The anger in the town is becoming visceral regarding the seemingly endless parade of applications and appeals from developers desperately trying to get under the wire and have their schemes approved before the Neighbourhood Plan and Core Strategy are in place, bringing some sanity to our planning system.